Trick or Treating is is a customary Halloween practice which involves children dressing in Halloween costumes going from door to door asking for treats such as candy or money. The trick part is the threat to perform some sort of mischief on those that do not give treats so it’s best to be prepared. When I was younger me and my siblings plus friends and neighbours would enjoy the yearly ritual of trick or treat tho we usually began a week or so before Halloween to make the most of it and it seemed more customary then for people to give money rather than sweets (usually odd bits of change) we were happy to get a pound or two each. Things seemed to have changed since then and it’s rare (at least where I live) for any knocks at the door before the 30th of October. Also it’s now more of a custom to give sweets rather than money. I’m not one for giving my kids lots of sweets but for a special occasion such as Halloween I don’t think the odd treats do any harm. It’s best to have a large bowl of mixed sweets ready for those scary Halloween callers. Swizzles Matlow have bought out a delightfully spooky range of sweet bags packed full of favourites for when the monsters come calling. We have some bags in time for Halloween. Whether they will last until the big day with my greedy kids or not is another terrifying tale. 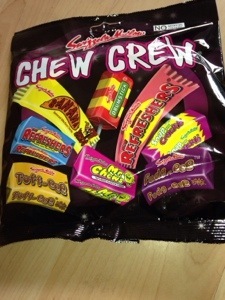 It contains tangtastic favourites such as refresher chews, drumstick lollies which are lovely and fizzy snap crackle plus Banana chews and Tof-eee and Fudg-eee which I haven’t heard of before so I think their a new addition. 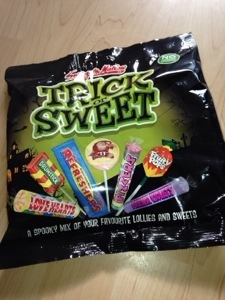 Trick or Sweet bag contains a spooky assortment of favourite sweets and lollies. Again it includes the all time favourites refreshers and drumsticks which I think most people love (adults included) and fizzers, fruity pops and love hearts which bring back some memories reading the little messages wrote on them. For Halloween it’s best to empty all the sweets into one large bowl and keep it close to the door and when for the tap tap tap from those ghosts and ghouls. Or if you wish you could just eat them yourself. Or have them on your table at your Halloween party. I think I will have to hide these away or else my little monsters will get to them first.